September 10, 2009, the FAA issued interim air traffic control procedures effective October 1, 2009, for the Airbus A380 operations. The procedure outlines aircraft separation, all references to “A380” have been changed to “A388” to reflect the correct International Civil Aviation Organization (ICAO) aircraft type designator, and identifies the aircraft as “Super”. Aircraft are categorized by ICAO (International Civil Aviation Organization) according to the wake turbulence they produce. Because wake turbulence is generally related to the weight of an aircraft, these categories are based on one of four weight categories, light, medium, heavy, and super. 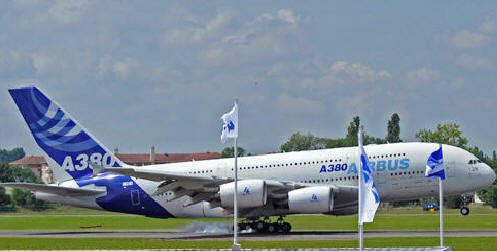 Due to their weight, all current wide body aircraft are categorized as heavy, or in the case of the A388, super. The rule applies to Air Traffic Organization (ATO) service units; En Route and Oceanic, Terminal, and System Operations Services. Aircraft traffic flying enroute classified as small, large or heavy behind an A388 will have a minimum separation of 5 miles. When transitioning to terminal airspace, aircraft separation will be not less than a minimum of 10 miles of spacing. ATC will refer to all A380 as “Super” immediately after the aircraft call sign and when issuing traffic advisories, and all communications. Visual separation rules behind A388 shall be 6 miles for aircraft classified as Heavy, 8 miles for aircraft classified as Large and 10 miles for aircraft classified as small. When applying wake turbulence separation for terminal operations that are defined in minutes, one additional minute will be added.